The 7B50 and 7B51 Time Base units are recommended for use with the 7400, 7500, 7600 and Storage FAMILIES to provide bandwidth/sweep speed compatibility. However, the 7B50 and 7B51 may be used in any 7000-Series mainframe. They are identical units except in two particulars. In combination, they provide a delaying-sweep mode in operation; the 7B51 being the DELAYING SWEEP and the 7B50 the DELAYED SWEEP. The 7B50 also has a horizontal amplifier input for uncalibrated X-axis deflection from an external source. The calibrated TIME/DIV range is from 5 ns/div to 5 s/div. 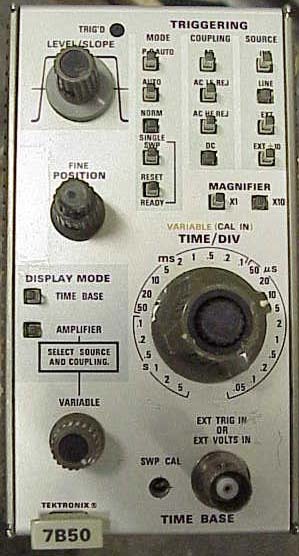 The 5 ns/div rate is otained with the X10 MAGNIFIER. Triggering control is very flexible with 12 push-button positions to program MODE, method of COUPLING, and SOURCE. For routine applications, hands-off triggering is accomplished by actuating the three upper-most push-button switches: INT SOURCE, AC COUPLING, and P-P AUTO MODE -- the most commonly used combination. The P-P AUTO MODE provides a baseline trace in the absence of a signal and a triggered trace at any position of the LEVEL/SLOPE control when a signal of 0.5 div or greater is present. Except for the selection of + or - SLOPE, this mode is completely automatic. The other triggering positions are useful for specific applications. The triggering frequency range is from DC to 100 MHz, selectable within that range by the method of COUPLING. AC LF REJ attenuates undesirable trigger components below 30 kHz (60 Hz would be almost totally rejected); AC HF REJ attenuates high-frequency components (above 50 kHz) which can cause triggering problems during low-frequency applications. SINGLE-SWEEP functions with lighted READY indicators and manual reset are associated with the trigger MODE controls. For delaying-sweep operation, the 7B51 (occupying the A horizontal channel) contains the DELAY TIME MULTIPLIER and control circuitry to release the 7B50 DELAYED SWEEP (B horizontal channel) at a predetermined point during the delaying sweep. After release, the delayed sweep can be programmed to begin immediately or wait for the next trigger event. Both units can be used singly in all 7000-Series mainframes, or in combination to add the delaying-sweep function. Independent dual-sweep operation is possible only in mainframes with two horizontal amplifiers using CHOP or ALT modes. $450 (1973) . . .